The Nebraska Kidney Association and the Platte River Fitness Series join together to fight against kidney disease and promote organ donation through the Nebraska Kidney Association. 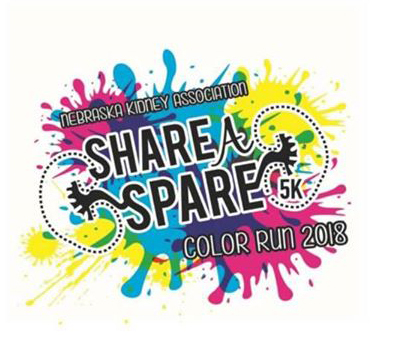 The Nebraska Kidney Association will use proceeds from the 2019 Share a Spare Color Run/Walk to fulfil its mission to provide resources that ensure Nebraskans with kidney disease continue living the Good Life. The Nebraska Kidney Association does this through advocacy, education and early disease detection and patient services. Every dollar raised in Nebraska, stays in Nebraska!